SAVANNAH, Ga., Dec. 31, 2018 /PRNewswire/ -- Gulfstream Aerospace Corp. today announced it recently made the first international deliveries of the clean-sheet, record-breaking Gulfstream G500. 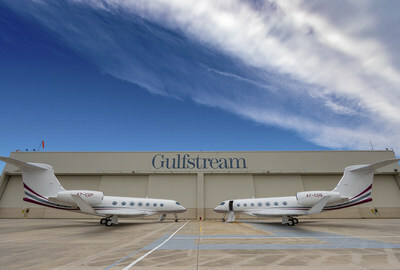 Qatar Airways received two G500 aircraft at Gulfstream's Savannah headquarters. The aircraft will join the five Gulfstream G650ER aircraft already in service with Qatar Executive, the airline's executive charter business. The all-new G500 earned its U.S. Federal Aviation Administration (FAA) type and production certificates in July 2018 and entered service in September. The Qatar Civil Aviation Authority validated the U.S. type certificate in October. En route to FAA certification, the G500 toured the world to give customers firsthand access to the aircraft, its Symmetry Flight Deck™ and class-leading interior. During the tour, the G500 flew nearly 130,000 nautical miles/240,760 kilometers and set 22 city-pair speed records, all in addition to the flying required for certification. In total, the G500 has already achieved nearly 30 city-pair speed records. "Gulfstream and Qatar Executive have been good partners since we announced the G500 and their intention to be its international launch customer," said Mark Burns, president, Gulfstream. "We are proud to deliver these aircraft just four years later and after the most rigorous flight-test program Gulfstream has conducted. Qatar Executive's world-renowned executive charter service is gaining mature, high-performing aircraft that set new standards in safety and comfort." Qatar Airways Group Chief Executive, His Excellency Mr. Akbar Al Baker, said, "We are truly delighted to be the international launch customer for the all-new Gulfstream G500 jet. This state-of-the-art aircraft will set a new industry benchmark and will offer our passengers an unrivaled flying experience. "Qatar Executive and Gulfstream share a special and strong relationship, one which has grown over the years based on confidence and mutual understanding. This relationship emphasizes Qatar Executive's commitment to provide an industry-leading product and service."